Get ready for the holiday festivities with our Festive Yule Log 'Cake' Recipe! 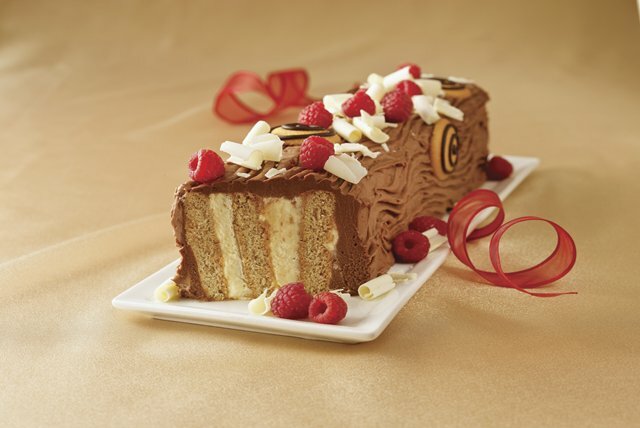 You'll be the talk of the party with this decorative yule log 'cake' recipe. Pipe small amount of semi-sweet chocolate into spiral design on wafers; refrigerate until ready to use. Beat cream cheese and butter in large bowl with mixer until well blended. Add remaining melted chocolate; mix well. Gradually beat in sugar until light and fluffy. Beat pudding mix and milk in medium bowl with whisk 2 min. Stir in COOL WHIP. Spread 1 rounded Tbsp. pudding mixture onto 1 graham square; cover with second graham square. Spread top with 1 rounded Tbsp. pudding mixture. Repeat with remaining graham squares and pudding mixture to form 12-inch loaf. Stand on edge on platter; frost with cream cheese mixture to resemble log. Run tines of fork over dessert to resemble tree bark. Refrigerate overnight. Meanwhile, make curls from white chocolate (see Tip); refrigerate until ready to use. Decorate with wafers, chocolate curls and raspberries. Cut into diagonal slices to serve. Prepare as directed with PHILADELPHIA Neufchatel Cheese, JELL-O Vanilla Flavor Sugar Free Fat Free Instant Pudding, COOL WHIP LITE Whipped Topping and low-fat graham crackers.